DAMASCUS, SYRIA (7:25 P.M.) – The Syrian Armed Forces, backed by the paramilitary National Defense Forces (NDF), carried on its counter-offensive in Hama northern countryside, restored several villages. Government troops managed today to secure six points they have previously lost to jihadi groups; all located between Khattab and Qamhanah. According to a military source, dozens of jihadi rebels were killed in the battles, as government forces prematurely destroyed a remote-controlled VBIED, 3 tanks and armored vehicles, as well as several artillery launching pads. The jihadi coalition, led by al-Qaeda-linked Jabhet al-Nusra, failed to break the Army defense lines in Qamhana following waves of massive attacks. Fierce clashes are currently taking place outside Khattab as the government forces attempt to break into the town which was taken over by militants in the first day of their assault. 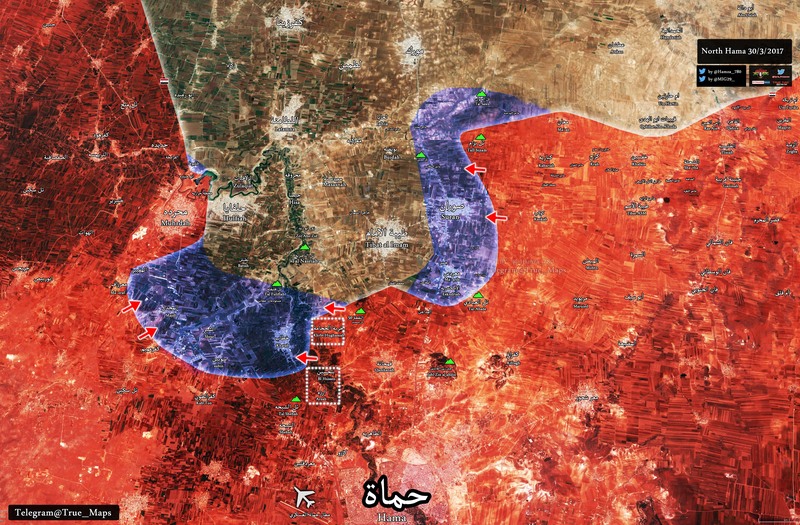 The best is that in the next 2 days the SAA and Hezbolah try to Capture Tal Nasriah and Tal Fuliflah, this would the SAA give a advance and fire control over the complete area and a chance to attack Hulfiah and Tibat Al iman in the future. De acuerdo con tu opinión, en esta oportunidad el ejercito Sirio debe continuar su ofensiva sobre los pueblos que fueron tomados hace mucho tiempo por parte de mercenarios.